Mayor of Glastonbury, Green Councillor Jon Cousins writes: On Wednesday 23rd November, I met with Chief Inspector Mark Edgington – Local Policing Commander for the Avon & Somerset Constabulary’s East Somerset Division – at Glastonbury Town Hall. The other background factor, which Sue Mountstevens had been very candid about, is the impact of the austerity funding cuts imposed by central government on the Police service as a whole, and the fact that Avon and Somerset has been intentionally ‘dampened’ – provided with less resources than other constabularies, resulting in £14 million ‘missing’ from the budget; which means 350 fewer officers, PCSOs and staff than the average! 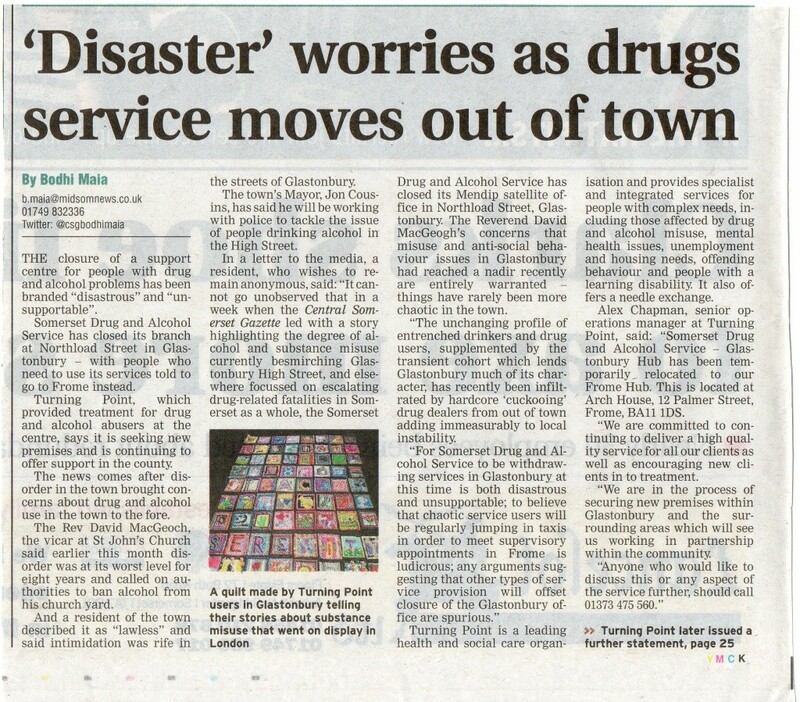 ‘Disaster’ worries as drugs service moves out of town – Central Somerset Gazette, 6th October 2016. Mark Edgington came to the Town Hall with Inspector Mark Nicholson of Glastonbury’s Neighbourhood Police Team, and they met with me and the Deputy Mayor, Cllr. Emma George to explore the proposed options to help the situation in Glastonbury – resulting from my meeting with the PCC. 1) The deployment of officers for a ‘permanent’ day-time police presence in the High Street. The Chief Inspector reiterating the message of the PCC – the Force has undergone major efficiency savings as a result of ‘Austerity’, and – in addition – will need to make further savings of £5½million… all of which has had, and will have, an understandable impact on resources and operations. I observed that the biggest response I’ve received from Glastonbury residents was their concern around the lack of a visible police presence – and the feeling that this lack has contributed directly to the rise in the incidents and problems we are facing as a community. This was something highlighted during my consultation in September, and, as a result, Cllr George and I had previously discussed the deployment of officers for a ‘permanent’ day-time police presence in the High Street with Inspector Nicholson and our local Police Team’s Sargent Slade. 2) The developing a Street Pastor team. We discussed the potential of a Street Pastor team to work as part of a multi-agency approach to addressing the anti-social behaviour. Mark Edgington was fully behind this initiative, and we agreed that this would be a useful option for the newly convened Glastonbury Multi-Agency Meeting to develop. Mark Edgington endorsed the PCC’s assertion that people who are worried about reporting crimes and incidents because they fear reprisals should use this anonymous, independent service – which is not part of the police. Find out more about Crimestoppers HERE. 4) Volunteers for Special Constables. 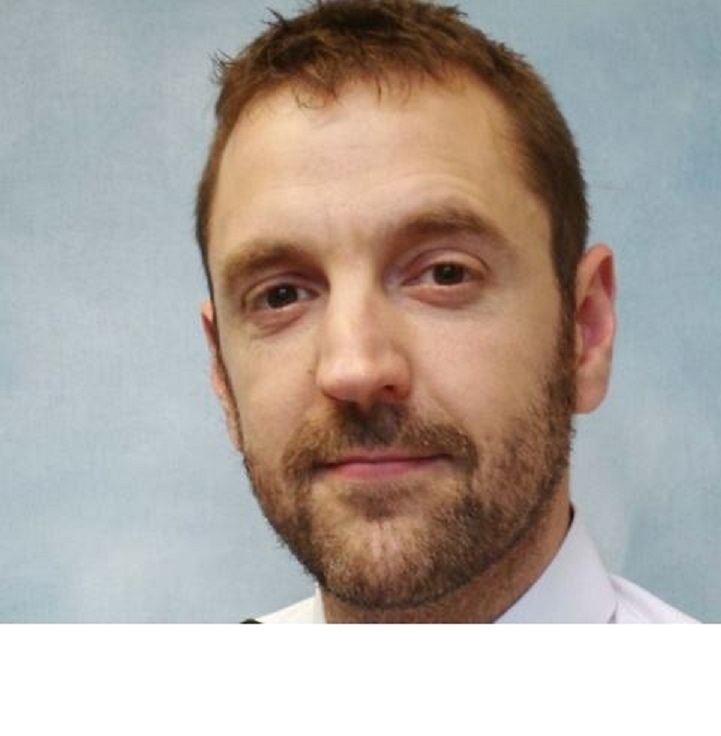 Mark Edgington felt that there was merit in promoting the Special Constabulary in Glastonbury; enabling people who felt strongly about the situation to volunteer for the Force. I mentioned that Cllr George and I would be meeting with the Special Chief Inspector Roger Ball and Special Constabulary Co-ordinator Katie Hancock later that day. Find out more about volunteering for the Special Constabulary HERE. £1 per month to keep town safe? – the front page of the Central Somerset Gazette, 10th November 2016. 5) The ‘Precept’ funding a Police Community Support Officer (PCSO). The final option we discussed was the potential for Glastonbury to fund an additional Police Community Support Officer for the town through the Parish Precept (the amount of the Council Tax that goes to Town and Parish Councils). 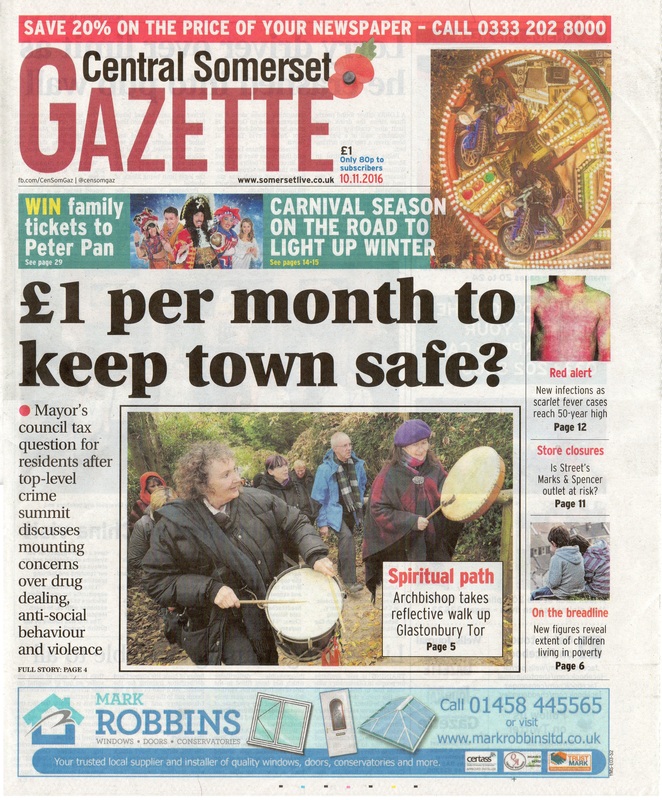 This is something I’ve encouraged residents to comment on – through the Central Somerset Gazette and via social media. Feedback has been largely positive, but with the specific condition that a PCSO paid for by Glastonbury would be on duty only in Glastonbury; providing a visible presence in the town – not constantly being called away to other areas. Mark Edgington and Mark Nicholson confirmed that the Town Council could fund a dedicated Glastonbury PCSO – recalled that PCSO Mel Rowlands was originally funded as a Glastonbury specific support officer. The Chief Inspector told us that “in terms of where a Glastonbury funded PCSO would start and finish their duty – what police station they book on and collect their equipment – I am unable to say with any certainty, but for the time being they would start at Street.” (N.B. Glastonbury Town Council may be able to provide an alternative ‘start and finish’ location for the new PCSO in Glastonbury). At the Town Council’s Finance & General Purposes Committee meeting on 29th November 2016, it was established that a Glastonbury funded Police Community Support Officer would add £11 to the Council Tax per band ‘D’ dwelling in Glastonbury – less than £1 per month. 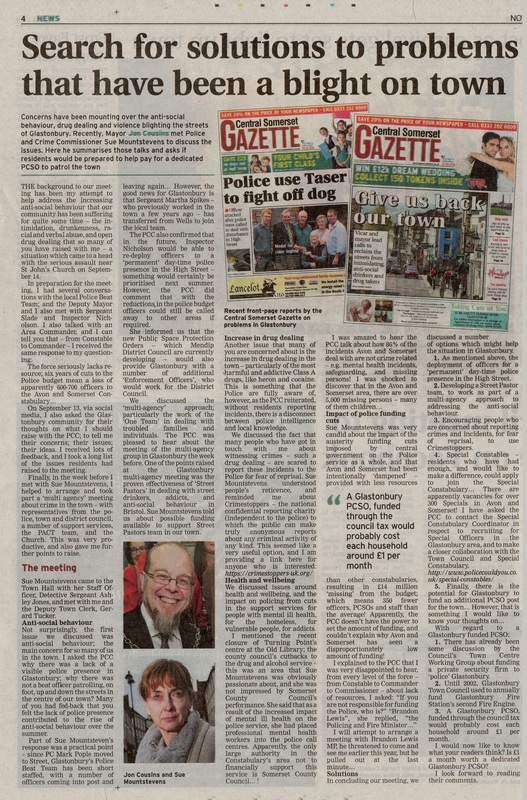 Search for solutions to problems that have been a blight on town – Central Somerset Gazette, 10th November 2016.